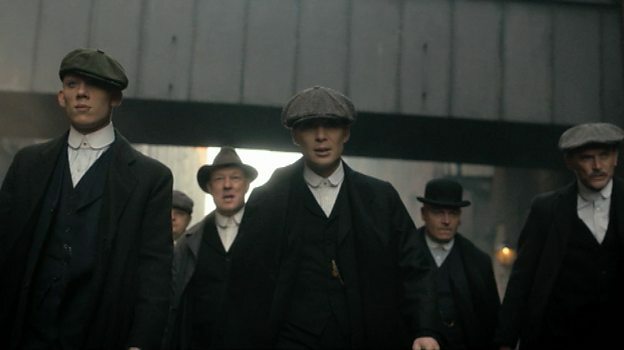 Peaky Blinders is an epic, six-part gangster drama set in the lawless streets of post-war Birmingham on the cusp of the 1920s. ﻿Britain in 1919 is a tumultuous mix of despair and hedonism, a nation cleaned out by the extravagances of the Great War. Returning soldiers, newly minted revolutionaries and criminal gangs all fight for survival in an industrial landscape gripped by economic upheaval. Thomas Shelby and his family run the most feared and powerful local gang, the Peaky Blinders. Named for their practice of sewing razor blades into the peaks of their caps, they make money from illegal betting, protection and the black market. But Tommy’s ambitions go beyond running the streets, and when a crate of guns goes missing from an arms factory, he recognises an opportunity to move up in the world. Crime pays, but business pays better. As rival gangs, Communist revolutionaries and IRA Fenians descend on Small Heath in pursuit of the weapons, Winston Churchill dispatches a ruthless police chief from Belfast to impose order on an increasingly lawless city and recover the guns. Peaky Blinders is a six-part drama series for BBC Two by Caryn Mandabach Productions and Tiger Aspect Productions. It is created by Steven Knight, and written by Steven Knight, Stephen Russell and Toby Finlay. It is directed by Otto Bathurst and Tom Harper, and produced by Katie Swinden.